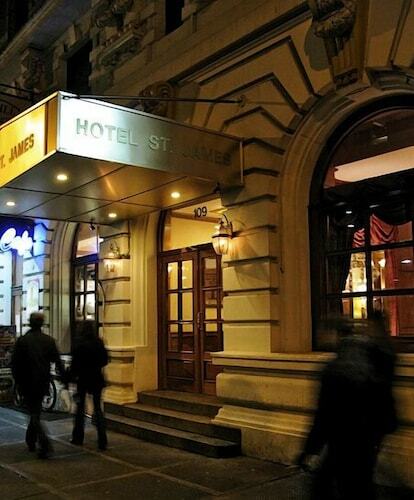 Located in the heart of Manhattan, Hotel St. James is a block from Times Square, and minutes away from Rockefeller Center, Radio City Music Hall, and Grand Central Station. 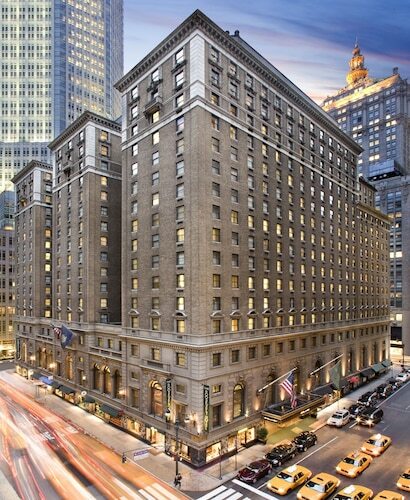 Built in 1981 by railroad baron Henry Villard and luxuriously renovated in 2013, the grand entrance of this hotel is right across Madison Avenue from majestic St. Patrick's Cathedral. 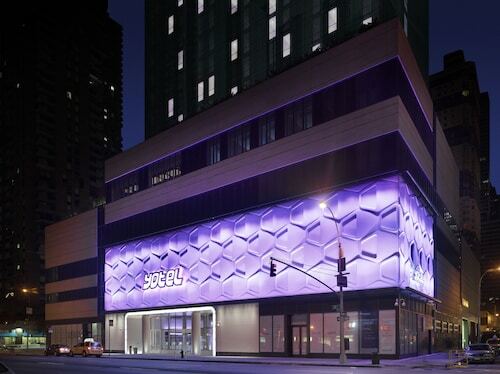 Opening onto both West 44th and West 45th streets, the Hotel Sofitel New York is just one block from 5th Avenue shopping and the Theater District. 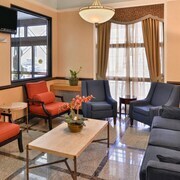 The hotel shares its excellent location with other fashionable accommodations and restaurants. 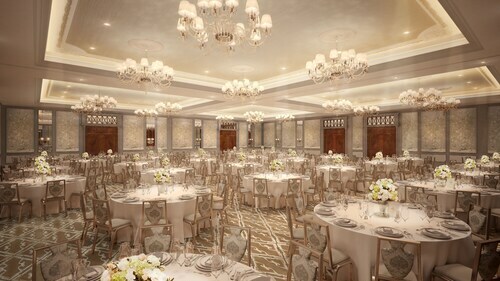 New York's Grande Dame, the Art Deco-style Waldorf Astoria New York offers a desirable Midtown location 2 blocks from Rockefeller Center and 4 blocks from the Broadway Theater District. Times Square, Central Park, Grand Central, and the shops on Fifth Avenue are among the nearby attractions. 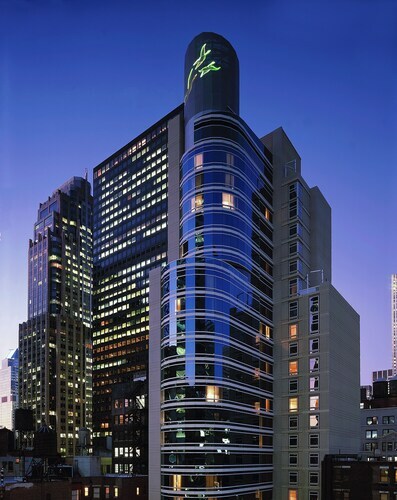 Located in Midtown, this luxury hotel is within a 10-minute walk of 5th Avenue, Grand Central Terminal, and St. Patrick's Cathedral. Rockefeller Center and Top of the Rock are also within 10 minutes. Lexington Av.-53 St. Station is 7 minutes by foot and Lexington Av.-63 St. Station is 7 minutes. Things happen fast in New York City, but even your easy-going holiday self will find some time to get lazy while relaxing in Washington Square Park or sitting back for a hot new Off-Broadway show. You might even see a future Tony Award-winner before she’s famous. Kick-start a culture fix with world-class art galleries throughout the five boroughs, sample fare from any corner of the globe in Brooklyn and shop till you just can’t anymore in Lower Manhattan. Book your flights to New York City and chow down on the “Big Apple”! 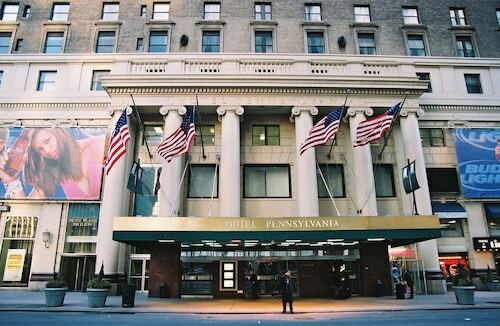 NYC is full of people, sure, but there’s always room for travellers in New York City accommodation. 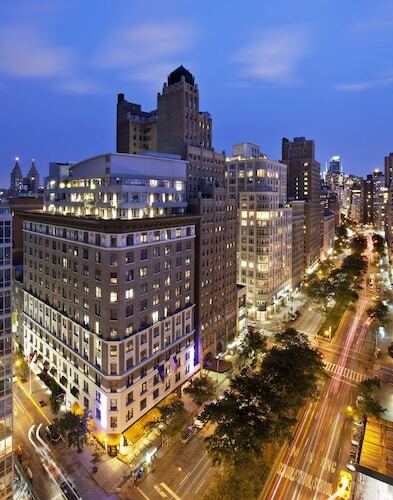 If you want easy access to the entire city, then book accommodation near Central Park. 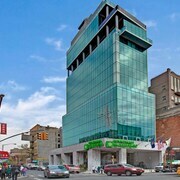 If you stay south of “the Park”, you’ll be mere blocks from Grand Central Station and major attractions, like Times Square, the Theatre District and Rockefeller Center. What can’t you do in “The City That Never Sleeps”, besides sleep? The answer is nothing, that’s what. 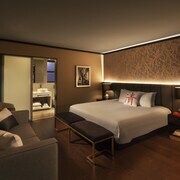 You’ll still want to reserve a hotel in New York City, though, for wardrobe changes. Speaking of wardrobes, shop off the beaten rack in vintage stores and boutiques in Williamsburg, Brooklyn. But fashion isn’t NYC’s only photo-ready feature. The best cityscape views can be found from the lush High Line Park, a repurposed portion of elevated rail line tracks in Lower Manhattan. While you’re in the area, pause at the National September 11 Memorial & Museum or catch the ferry to Staten Island to greet Lady Liberty as you float by…then grab an ice cream cone and float right back. In Manhattan (aka “The City”), load up on street food (bagels, anyone?) or fine dining on every corner. Museum-hoppers can go a little bonkers in NYC, too, from the Metropolitan Museum of Art in Central Park to the tiny Mmuseumm, a gallery of artefacts in an old elevator in Tribeca. And let’s not forget our four-legged and feathered friends at The Bronx Zoo. 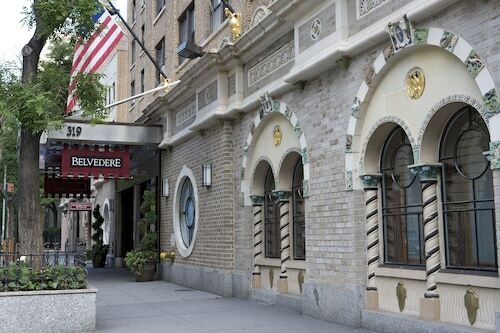 If you’re feeling knackered near the northern borough, you can always relax in accommodation in New York City’s Hudson Heights neighbourhood, with views of an idyllic monastery on the Hudson River. NYC is serviced by two major airports—John F. Kennedy International (JFK) and LaGuardia International (LGA)—both located in Queens. 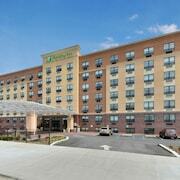 You can also fly in to Newark International Airport (EWR) in New Jersey. All three airports connect with public transport via the free AirTrain shuttle —and you thought NYC would be expensive. 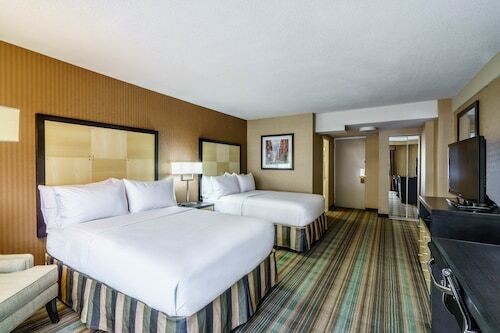 With an extensive subway and bus system and taxis galore, you can reach your New York City hotel and all the stops on your itinerary without your own set of wheels, though you may want to look into one of Wotif’s car hire options. If a lot can happen in a New York minute, it’s no surprise that NYC’s events calendar is always quadruple-booked. Summer is warm and balmy—the best time to be out in the streets for a festival. Get the season off to a big start at the annual Pride Week parade, which dances its way down Fifth Avenue the last Sunday of June. Speaking of dancing, SummerStage—a free concert series with international headliners—kicks off in Central Park each June and runs through September. As summer turns into autumn, the whole city puts its best foot forward in designer pumps for New York Fashion Week. If you’re planning your holiday around the best food in New York City, then visit in time for the Feast of San Gennaro; for 11 days you can eat your weight in cannoli and other Italian delights. You’ve probably heard a thing or two about Central Park. From the iconic Bethesda Fountain to mellow Sheep Meadow and the Metropolitan Museum of Art, Central Park makes all the other green spaces jealous. When you want to put your feet up on a bench and chat with squirrels, you’ll run right into this grassy oasis smack dab in the middle of upper Manhattan. 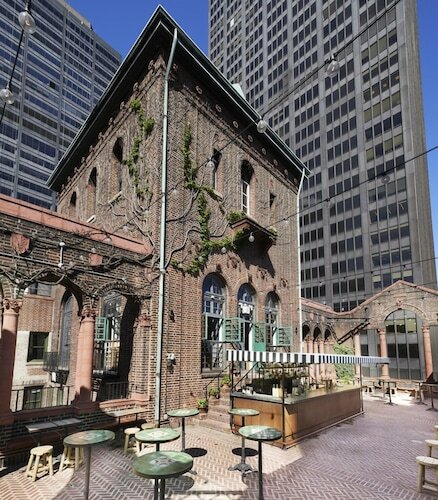 You don’t have to be uptown to get your tranquil on, though. If Brooklyn is more your scene, then check out Prospect Park. Tromp through The Long Meadow or float outside The Boathouse during the warm months. Here’s a local tip, too: Prospect Park is a great place to slice across an ice rink without the crowds of onlookers at Rockefeller Center or Bryant Park. If your double axel is more of a bunny hop, no worries! Not really the outdoorsy type at all? Stay above the tree line with a Helicopter Tour of NYC Landmarks. You’re welcome. If you’ve got just one day in New York City, well, good luck. Haha, sorry. NYC bucket lists can get lengthy, but if you have to be picky, go straight to the top. No, not at the Empire State Building—you can’t admire it if you’re standing on it. Instead, look out over Manhattan from the Observation Deck at Rockefeller Center. 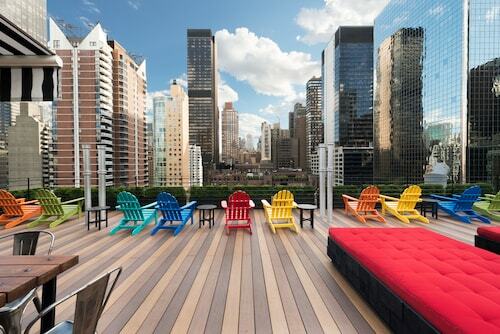 Take a turn around the deck to see a panorama of the Chrysler Building, Times Square, the Theater District and the Empire State Building. You can even see New Jersey and Queens, depending on where you’re standing. This isn’t the only landmark you’ve got to add to your itinerary, but it’s an awesome place to start. Just look out over the city, point and say, “That’s next”! Any time is a good time to take a New York City holiday —and you’ll save extra on hotels and flights when you mix and match with Wotif. 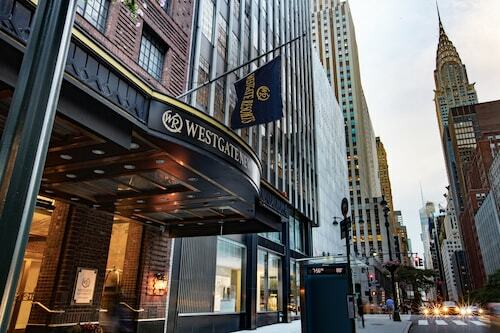 There are so many great places to stay in New York City—take advantage of our awesome deals and you can holiday in style, without having to call in any favours on Wall Street. How Much is a Hotel Room in New York? 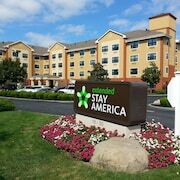 Hotels in New York start at NZ$115 per night. Prices and availability subject to change. Additional terms may apply. Perfect position, amazing staff, great facilities. The place was small (as to be expected in New York), but it was difficult to open the suitcase on the floor as very limited space. Hotel was as to be expected for the price and location. Place was clean and tidy. Was quite loud at night, being next to the fire station, we heard a few sirens at night (but also could be hard to avoid in NY). The forced air also woke us up most nights as was quite loud. The location was close to the natural history museum, west entrance of Central Park, and Columbus circle but not really walkable to Times Square or downtown. Easy enough to catch the metro which was close by.